One of the major reasons for the American invasion and conquest of Iraq in 2003 was the argument that more democracy would automatically lead to more peace in the world. It was a manifestation of some of the Utopian fantasies about free trade and parliamentary democracy that became popular in America after the end of the Cold War. Indeed, some even claimed history was now "over". Free trade would lead to world peace. Parliamentary democracy would prevent war. These ideas need to be examined. We have already discussed the appalling ethical and practical aspects of the destruction of our planet's environment by the current world political "order". See our report. The issues discussed here raise further ethical questions about what is going on and the nature of the political theories and leaders that are currently in power. The predominant form of parliamentary democracy in the world today is the Anglo-American model. However, a look at the both nations histories reveals anything but a peace loving record. The Anglo-American slave trade was the largest and most brutal in history. The British Empire conducted one of the most ruthless campaigns of global imperialism. America's record is even grimmer. It launched the most comprehensive campaign of racial and ethnic imperialism in world history. Indeed Hitler chose America's conquest of its territory as a model for what he wanted to do in his conquest of Russia. See our report on this. By the end of the nineteenth century most of the major European states were democracies. Unfortunately, democracy totally failed to provide a safety catch on war. Indeed, it often led to growing political efforts for aggressive international actions. In France, for example, democracy helped fuel nationalistic visions of global imperialism in the Third World and plans for a war of revenge against Germany. Almost all forces of democracy enthusiastically rushed into World War I, predicting glorious victories for the war they helped to produce. What is particularly disturbing is that events like this are reflected in the grim and violent track record of ancient Greece and Rome, the political models on which America is based. Pericles and his imperialist foreign policies led Athens into such a national catastrophe that democracy was largely discredited in the ancient Greek world. None of the great minds of Greece that followed Pericles, such as Socrates, Aristotle, Thucydides, Xenophon, and Plato, saw him as any kind of hero. Socrates even ridiculed Pericles as a "pastry cook". The "Cult of Pericles" is an invention of the modern Western world over 2,000 years after he led Athens into ruin and disaster. Furthermore, Athens was never a major world power like Persia. It was Alexander the Great who made Greece a world power, and he despised Athenian democracy. Indeed, Athens actually supported Persia during Alexander's campaign for world empire. The fact that the New Testament was written in Greek and the word "democracy" is not mentioned once in the entire work is an example of how democracy had been consigned to the rubbish heap of Greek history. Athens even ordered the execution of its greatest philosopher, Socrates. See our report. The empire of Alexander marked the transition of ancient Greece from the Classical to the Hellenistic era. In this era two giant empires dominated the Greek world, the Ptolemaic Empire, whose key possession was ancient Egypt, and the Seleucid Empire, which stretched from the Mediterranean Sea to the borders of India. The political mentality of this empire can be seen in some of the quotes we have assembled from Plato and Aristotle. These quotes speak for themselves in terms of their totally anti-democratic point of view. Unlike ancient Athens, the Roman Republic did become a major world power. However, this was hardly a happy story. The Roman Republic was one of the most brutal imperialist regimes ever seen. Most of the "Empire" was conquered by the Republic. The Roman Republic set up the largest and most brutal human slave trade ever seen until the Anglo-American slave trade of modern times. Unfortunately, military conquest abroad did not bring peace at home. The huge influx of foreign wealth led to violent class warfare, culminating in a series of appalling bloody civil wars. After Augustus established the Empire in 40 CE, democracy had so little credibility that it largely disappeared for almost 1,700 years as a serious political force in the West and did not come back into favor until the 18th century. 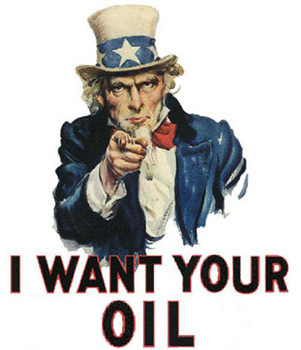 In looking at modern Anglo-American democratic imperialism, the following reports merit attention. The Mass Murder of Civilians by Air Power by the British Empire Iraq in the 1920's marked the beginning of a grim new era of war. Iraqis rebelled against British imperialism after they found out that Britain's promises of Arab freedom in their uprising against Turkey were a lie. It was a similar situation but a more open case of fraud than the American double cross of the Philippine independence movement discussed below. Arthur Harris, who would later slaughter hundreds of thousands of German civilians with great enthusiasm, was equally upbeat when it came to murdering Iraqi civilians. Winston Churchill, the hero today's American neocons, also played a major role here. He enthusiastically backed the use of poison gas against Iraqi civilians. Britain repeatedly fought against any effort to curb the bombing of civilians in all the arms control negotiations of the interwar period. Mike Davis, Late Victorian Holocausts How millions died due to colonial manipulation of food production. 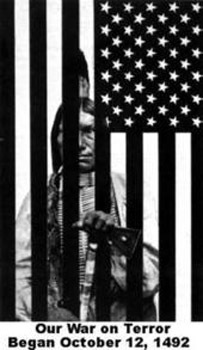 The Removal of Native Americans from the Eastern U.S. Hitler saw this as a great model for his plans. See our report on this. The Homestead Act A classic example of imperialism. American whites were given land conquered from native Americans. Slavery and Reparations The American economy got a giant boost from a comprehensive system of slave labor. After the Civil War slaves were supposed to receive some kind of compensation such as 40 acres of land. A bill passed Congress to this effect. Due to a Presidential veto they got nothing in financial compensation. US War Crimes in Phillipines After betraying the Philippine independence movement America proceeded to kill one million of its people to make it a colony of America's growing empire. Dishonesty of Woodrow Wilson Wilson was without a doubt one of the greatest frauds in all of world history. This is really quite an achievement. A narrow minded racist who loved the Ku Klux Klan and resegregated the U.S. government, Wilson also had self-righteous religious delusions about being some sort of world savior. The German people surrendered because of Wilson's promise of the 14 points. What they got instead was the Versailles Treaty which violated almost every one of those points. Wilson's lies did much to set in motion the rise of Hitler and helped lay the groundwork for an even bigger world war than the one he assured everyone would be the "war to end all wars". A particularly macabre aspect of Wilson's tactics was his continuation of the food embargo aginst Germany which killed thousands of German children. The Western Betrayal of Poland England and France stood back and let Hitler crush Poland after assuring the Poles they would attack in the west. 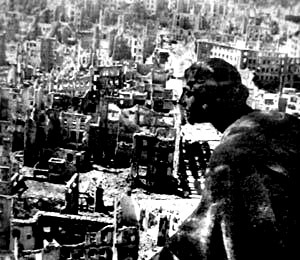 The Anglo-American Destruction of the Cities of Germany and Japan It is important to note here that the wholesale destruction of entire cities was the very specific goal after the adoption of the policy of "area bombing" in early 1942. It was not some sort of unfortunate side effect of an effort to hit military targets. Many people are still unaware of this. More people died in one night at Hamburg than in the entire German bombing campaign of Britain. The Expulsion of 15 Million Germans from their Land by Poland and Czechoslovakia At least two million died under appalling circumstances in one of the greatest war crimes in history. Japanese Biological Warfare Atrocities and the U.S. Coverup One of the worst war crimes of World War II was never prosecuted at the Tokyo War Crimes trial because America wanted the expertise of these criminals for its own biological warfare plans. America's 2003 Invasion and Occupation of Iraq - Some Relevant News Stories One million Iraqis have been killed. Poverty, sickness and violence have soared. Torture was used on a massive scale. Religious Problems in Modern America - Religious Justifications for War and Conquest This is particularly chilling. Many top American religious leaders are claiming that God has endorsed a global campaign of war and imperialism.